It has just come out that the Israeli military has earmarked ten percent of the land in the Occupied West bank for Israeli settlements. In addition, the Israeli government is moving forward with an outrageous plan that will mean the expulsion of tens of thousands of Bedouin citizens in the Negev desert. The context is the warning issued by Israeli Prime Minister Binyamin Netanyahu in a 2010 government meeting that a Negev “without a Jewish majority” would pose “a palpable threat”. You won’t be told about this by television news, your elected representatives, or the US State Department (in fact, when asked about the Negev displacement plan they dismissed it as an “internal Israeli matter”). But this is the inconvenient truth that prompted the UN’s Committee on the Elimination of Racial Discrimination to recently issue what according to one expert was the most cutting “condemnation of a legal system of segregation since apartheid South Africa”. That is why Land Day, beginning with the struggle for the land, is now marked all over the world as the movement for decolonisation and equality in Palestine/Israel gains momentum. March 30 is marked by Palestinians as Land Day, but many in the West are unaware of the origins and significance of this annual protest. It is an opportunity to shed some light on the significant issues marginalised by the mainstream discussion about the “Israeli-Palestinian conflict”. The first Land Day was held by Palestinian citizens of Israel (so-called ‘Israeli Arabs’) in 1976, as part of opposition to the expropriation of land by the state. Marked by a general strike and mass demonstrations, the response was brutal repression: six Palestinians were shot dead, as the Israeli government mobilised armoured vehicles and tanks to patrol villages in the Galilee. In the aftermath, then-Prime Minister Yitzhak Rabin’s cabinet “unanimously commended the security forces for their ‘restraint’ in handling the strike and the ensuing disturbances”. It was a justified response, apparently, to what Prof. Oren Yiftachel described as “a head-on challenge to the Judaization project”. The land expropriations that led to Land Day were one example of how, in the words of Israeli legal advocacy group Adalah, the state “confiscated massive amounts of land from Palestinian citizens” after 1948. Estimates are that by the late 1970s, the average Arab community had lost between two thirds and three quarters of its land. This is one facet of a discriminatory regime that goes to the heart of the question of Palestine: a history of ethnic cleansing, confiscation, alienation, and manipulated planning – all in order to maintain a system that privileges one group over another. As former Israeli PM Menachem Begin’s adviser on Arab affairs put it: “If we needed this land, we confiscated it from the Arabs. We had to create a Jewish state in this country, and we did.” The facts bear out this honest appraisal. In 1948-53, 95 percent of new Jewish communities were established on ‘absentee’ property – that is, belonging to Palestinian refugees prevented from returning. Yet a number of Palestinians remained, and particularly in the Galilee and the Negev in the south, the Israeli state was concerned about the ‘demographic battle’. This discourse (and the policies shaped by it) continues through to the present day: the current Housing Minister spoke in 2009 of it being a “national duty” to “prevent the spread” of Palestinian citizens in the Galilee. Israel’s systematic ethnic discrimination means the manipulation of regional authority boundaries and the planning regime. Misgav Regional Council, established in the 1980s, is an illustrative example. Given “a highly irregular geographical shape, in order to include most Jewish settlements and exclude most Arab villages”, the result has been to reinforce “patterns of functional and social segregation in the region”. In other words, Misgav is “not a regional plan in the ordinary sense” but “a strategic plan…to preserve state lands”. Remember – this is all inside Israel’s pre-1967 borders, the supposed ‘democratic’ Israel loved by liberal Zionists who restrict their criticisms to West Bank settlements. But what do liberals say about admission committees that operate in around 70 percent of all communities in Israel, a key tool in the exclusion of Palestinian citizens and the maintenance of Jewish control over rural land? These committees are now supported by legislation in around 40 percent of communities; supporter of the law MK David Rotem said that he believed Jews and Arabs could be “separate but equal”. This is the reality for Palestinian citizens that Israel and its advocacy groups don’t want to talk about, preferring false platitudes about ‘the only democracy in the Middle East’. These policies are what unite the experiences of Palestinians in both the pre-67 borders and in the West Bank. 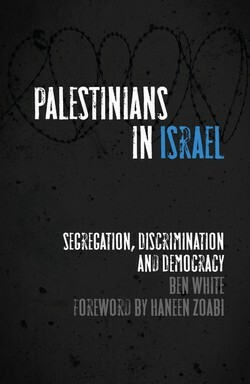 Ben White’s new book is “Palestinians in Israel: Segregation, Discrimination and Democracy”, available at Amazon.